So, for those of you who've watched the Frozen trailer, you know that Aqua seems to have gone "seeker of darkness" on the heroes, with gold eyes and bleached hair like the other half-Xehanorts. But what if I told you the basis of that scene could actually be because of a technical limitation from one of the HD Remixes? 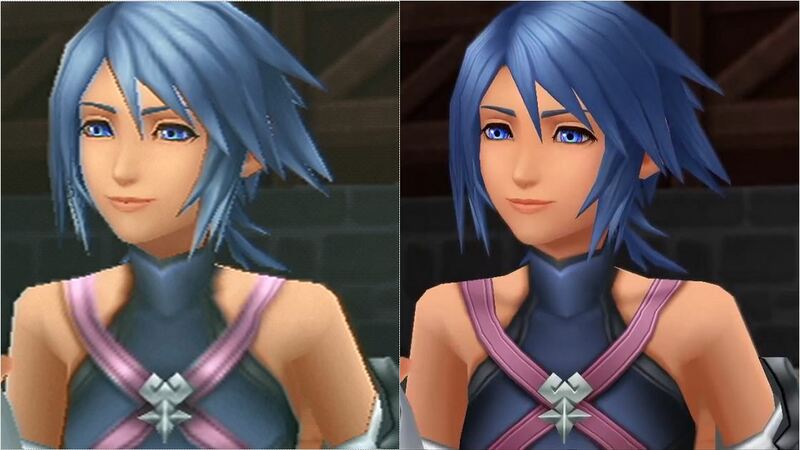 If you recall, the PS3 edition of "Birth by Sleep: Final Mix" updated Aqua's original in-game model to give her darker hair than her PSP model, which had lighter hair (image linked here due to size: http://kh13.com/forum/uploads/gallery/category_2/gallery_51542_2_8725.jpg). However, this unfortunately couldn't be done for the game's secret ending, which was pre-rendered using the original PSP models. The result was an inconsistency where Aqua is seen chatting with Ansem at the edge of the Realm of Darkness with lighter hair than normal with no explanation. Except...now I believe the crew has decided to give one. I think we can safely say that the HD Remixes more or less overtake the canon of the original releases, due to being the most updated versions. If that's the case, then I think the writers decided on retroactively making Aqua one of Xehanort's vessels solely to account for this mistake. The one thing I could find that would go against this is the cutscene from KH0.2, where Aqua's model appears to be unchanged from the one used in that game, but I think that could be chalked up to the writers coming up with the idea later on. What do you guys think? From what little else we know, the validity of this theory all depends on when and how Aqua came to look the way she does in KH3. Still, if it turns out to be true, then props to the KH team for crafting an incredible twist out of an apparent limitation. Could someone delete this thread? I think I posted it in the wrong place.